Do you ever feel like you just can't connect with your mentee? Well, technology can be a great way to do so, especially when you can't see them every week, let alone every day. It can give your mentee the opportunity to connect with you when you're not there in person. And, let's face it. Our youth are more communicative on their public web profiles about what's going on in their lives than they are when you sit across from them and point blank ask them. Now, I'm not saying that you should search through every bit of their profile to find out what's going on, but they may feel less threatened when you ask them a serious question online or through text. You can also leave on the note, "We can talk more about this when I see you on Thursday, okay?" There are a lot of different things nowadays that teens and even pre-teens are using. If you aren't familiar with some of the ones listed below, feel free to ask your mentee for a walk through. You would be amazed and how much they know about each of the sites and the details that they understand. This could be a great opportunity for you to acknowledge what they know and even ask them if this is something they have ever considered as a career. There are jobs that pay you to be on social media sites and monitor them! They can even tell you what they don't like about the site(s) they use, and you can write a letter together to those who manage the sites and provide your feedback. Users can post links to top news stories or "digg" (vote) them to the top. Mentor tip: Log on with them and check out the top stories. Sometimes they are truly bizarre and can start a great conversation. Mentor tip: There is a "chat" option which allows you to instantly message anyone who is online. It's an online version of sending texts. This gives your mentee the opportunity to talk with you about anything at any time. Mentor tip: Upload your pictures you take on your outings together and give your mentee the link so they can download your shared memories. Mentor tip: This is used more by junior high & high school students than Facebook, and sometimes even elementary students, even though you must be 13 or older to have a page. Most of you are familiar with this one at least, and if your mentee has their own cell phone, it's likely that they have sent texts to friends during your times together. Mentor tip: text them a reminder about meeting up later for a Blenders. Like Twitter in that you can post quick thoughts, but also give you the chance to blog full stories and post pictures. Mentor Tip: "Follow" your mentee to see their quick, one line thoughts. These are often impulsive so they give you a good view into what's going on. Mentor tip: Ask your mentee to show you their favorite videos. They may not be entertaining for you, but it can give you an idea about what it is that they find entertaining. Click Here for a more complete list of social media sites. There's everything from gaming sites to blogging to music sharing. Now some of you may think that promoting use of techonology to communicate is a backwards step in your mentorship and promoting healthy communication skills, but the way I look at it is that if you open yourself up to communicating on their level, they will be more likely to communicate on a more professional level in the future. You can talk about the benefits and downfalls of each type of communication. Clearly, texting lingo is different from the language used in most professional settings, but it gets their message across to their friends in a way that they can relate, thus building their peer social skills. Don't worry; they'll get older and hopefully mature with their texts. And with phones like the iPhone, words often self-correct with Auto Correct. For example, "ive" would change to "I've". So have fun with it for a little while and see how it goes. Well, today marks the first day of the 2010-2011 school year for most of the Santa Barbara, Goleta, and Carpinteria schools!! Are you excited?? There is so much that they are going to be experiencing this year, new and old. Anxieties, fears, new friends, maybe even new schools. Even if they say they're not excited to go back to class, every kid has some part of them that is happy to be back. They have a schedule, structure, somewhere to be every day. All of their friends are back in one place, and they probably have new clothes to show off. At the very least, most of our kids are glad to be in a safe place for the majority of their day. All that said, don't be surprised if they tell you that everything's "fine" when you ask about the first days of school. It's almost expected. So think of a different question. Maybe something like, "What was the first thing that made you smile?" or "Who had the coolest haircut?" or "Who were you most excited to see after the summer break?" If you try and narrow on one thing in particular, they have to think about it a little harder. It also shows that you really do care about their first days of school...and, achem, them!! 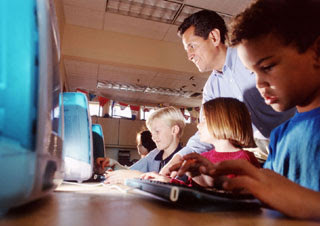 The beginning of school also means that Computers For Families will be distributing computers through the local schools. If you think your mentee would benefit from having a computer in their home, check out the CALENDAR to see when they'll be at or near their school. Call Kristine Mainland-White at (805) 964-4711x5400 for more details or speak with your case manager. Computers are typically for elementary grades, but if you have a middle school mentee who you feel needs a computer in their home, feel free to call Kristine to talk with her about the options. Don't forget that Teresa and Juliana are here for you as your case manager. If you need help re-connecting with your mentee after the summer, please ask us! We are happy to attend your "first" school session with you, especially if you started meeting with your mentee this past summer and are unsure about how to transition. Marcia has been mentoring her mentee for almost 3 years and has seen her through many experiences. Marcia was able to communicate easily with the shy 5th grade student during their first few meetings and their relationship has grown stronger ever since. Her mentee was referred as a daughter of a single mom with 1 brother and 3 sisters who desired individualized attention and new experiences. Her teacher even stated that a mentor who opened up "new worlds" would be desirable. Marcia has proven to do all these things and more and provides her a strong support system no matter what the circumstances. Her mentee's attendance record was another reason for referral, and since Marcia has stepped in and helped her with her organization, the number of tardies and absences has significantly decreased. Her mentee aspires to be a veterinarian, so together they venture to the zoo and butterfly preserve amongst other animal-inspired locations. Marcia encourages her mentee to explore her creativity through a love of art and together they make gifts at 2000 degrees for many occasions. Her mentee's mom has seen the value in their friendship and is very supportive of all that Marcia does to encourage her daughter in her growth and development. Marcia, thank you for all that you do with your mentee, and we are excited to watch your relationship grow over the coming years. 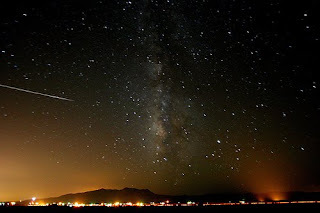 It's that time of year again to look up to the skies in the late night hours to view the spectacular showing of the Perseids. This Thursday, from 10 pm to dawn, you can watch the meteors go by during the peak of the shower. Best viewing times will be the hours right before dawn, as NASA states, "dozens of Perseids will be seen per hour." Try and get to the high spots around Santa Barbara, away from street lights, as the less light that interferes, the better the show!! If you want to know more about stargazing and constellations, you can also contact El Capitán State Beach about Astronomer-led stargazing with telescopes that occur once a month beginning in May each year. They can be reached at (805) 968-1033. You can also go up to Westmont College every 3rd Friday of the month for a free public tour of the observatory & Keck telescope. Click here for a great sky map for August, or here for the website, which updates the maps every month. Just scroll down about halfway and click on the link for the PDF download in whichever language you'd prefer.